This week we remain in Rome, where Sketchfab Master Néstor F. Marqués shows us a sculpture and a building, both related to ancient Roman sport. My name is Néstor F. Marqués, I’m a Spanish archaeologist specialized in applying cutting edge technology to archaeological studies, art, heritage and the humanities world in general. I’m currently developing my research in the Royal Academy of Fine Arts of Spain in our recently created Digital Humanities Lab. In this lab we develop new uses in different fields such as 3D virtualization, augmented and virtual reality, 3D printing and others. The Boxer scan was made a few years ago when I was getting into the 3D world and this Digital Humanities Lab was only in my mind. But before I tell you that story, let me introduce our main character here, this stunning bronze statue. The so called: Pugile delle Terme (Terme Boxer) is one of the finest surviving bronze Greek statues, dating to around the year 330 BC. It is attributed, although not unanimously, to the famous Greek sculptor Lysippos. It is known that a lot of Greek sculptures were carried to Rome during the Empire to decorate important buildings. This one in particular was found in the excavations that were carried out on the south slope of the Quirinal hill in Rome in 1885 (fig. 1). Now we know that this area corresponds to the remains of the baths of Emperor Constantine, in which it was possibly situated. Fig. 1. The bronze statue of the Boxer at the time of discovery in 1885 on the south slope of the Quirinal hill in Rome. The statue represents a resting boxer right after a fight still with the wool-lined leather gloves on, breathing heavily and bleeding from the wounds of the fight. We are in front of a true masterpiece of ancient sculpture, the quality of the details is amazing. For instance, take a look at the wounds, the blood is “painted” with copper to give it a vibrant red look (Fig. 2). Fig. 2. Detail of the Boxer’s face with bleeding wounds and the nose broken. Now that we know a little more about this sculpture, you can conceive why is one of my favorite heritage pieces around the world and why I chose it to be my first “big” 3D scan. 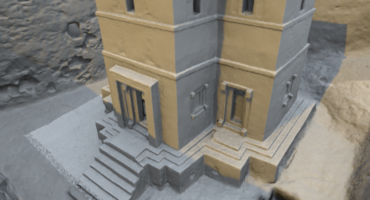 In 2013, as I was telling you earlier, I was starting to dive seriously into 3D scanning and photogrammetry as a perfect way to create detailed 3D geometry with a photorealistic texture finish and low production costs. During a trip to Rome I decided this was the sculpture I wanted the most to have in 3D. I went to the National Archaeological Museum (Museo Nazionale Romano – Palazzo Massimo alle Terme) and started to shoot photos with my old Canon 450D (fig 3). Did you notice there’s a Non Accostarsi (stay clear) sign in front of the statue in the picture above? Did you also notice the alarms placed on each side of the base? Well… the alarms ringed more times than I could count, but after explaining to the museum staff what I was doing, they let me continue and for that I have to thank them. Half an hour and about 60 pictures later my scan was complete. Although this scan is almost three years old and nowadays I would have made some things differently and used other gear to make it, I’m quite proud of it, as it reminds me of my beginnings and the hard work and struggle it took to get where I am now (although it’s not the end of my route yet, since I am 25 years old). I normally use this scan to show my students in the courses I teach, that 3D scanning has been democratized by this technique. Everyone with a regular camera can 3D scan the world. It doesn’t matter if you don’t have the money to buy an expensive DSLR and a powerful Pc (or an even more expensive laser scanner only affordable by big institutions). I did this with my old basic camera and my old laptop. So every time I scan a heritage object, every time I get into my lab, I remember the Boxer and everything he has brought to me. You may not know when it was built, you may not know what its real purpose was, but definitely you know it exists. The Colosseum is one of the best buildings of the Roman Empire still standing. It was built between 24th of May 70 AD and 29th June 80 AD by the Flavian dynasty. Started by Vespasian and inaugurated by his son Titus, the Colosseum was meant to be the most glorious amphitheater in the world (and it still is!). It was built in travertine stone, which gives the façade a bright white shine with golden reflections. Although time and mostly pollution had erased this original shine, a very recent restoration has brought it back to us. You can compare the 3D model which was made before the restoration and the images below (figs. 4 & 5), corresponding to the actual look. The Colosseum once was the best place in the world to watch munera gladiatoria (gladiator fights), venationes (hunting of wild animals) and prisoner’s executions (but not Christian’s martyrdom, or not a lot of them, as you may have heard!). Nowadays, the Colosseum has become one of the most important monuments in the world, and that’s why it makes sense to have it in 3D, or at least that was my original purpose when I decided to do it. 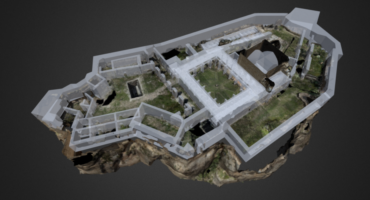 Don’t get me wrong, 3D scanning the Colosseum would be a huge deal for a large team and would have needed a lot of permits to fly above Rome with a drone, but this model was made by one person only and without leaving the desk. How? I’ll tell you right now. As I told you above, I coordinate the Digital Humanities Lab in the Royal Academy of Fine Arts of Spain. One of our goals is to do research and develop new ways to bring heritage to as many people as possible. The Colosseum seems like an obvious choice to have available in 3D, but until March 2016 it just wasn’t there. Thus, I took images from the internet (there are quite a few of them) and also maps imagery to make the photogrammetric model as if I had been there taking the images myself. There’s a lot of potential when it comes to what is known as involuntary photogrammetry, because there are a lot of photographs around of the monuments. Also it has been used to document endangered Heritage or even destroyed monuments like the ones sadly destroyed in Syria by terrorists recently. If you have any questions, suggestions or projects you want to discuss with me, or you want to see other scans I’ve made since then (I’ll tell you more about some of them in other stops of this route around the world) you can contact me via my Sketchfab profile or by mail. To see more of Néstor’s models here on Sketchfab, check out his profile.